The Larson Electronics EPL-24-2L-LED-D-V2 Explosion Proof 0-10V Dimmable LED Light Fixture is United States and Canada approved Class I Divisions 1 & 2 and Class II Divisions 1 and 2 for areas where flammable chemical/petrochemical vapors exist or have the potential to exist. This explosion proof LED light has a T6 temperature rating and carries a paint spray booth light certification, making it ideal for applications such as paint booths, oil rigs, offshore applications, petrochemical, manufacturing, chemical storage, water treatment centers, and food processing plants. This two foot, two lamp dimmable LED fixture is ideal for operators seeking a top quality explosion proof light that will reduce operating costs, improve lighting quality and reduce downtime incurred from frequent servicing intervals. The EPL-24-2L-LED-D-V2 is equipped with Larson Electronics specially designed dimmable LED T-series bulbs which each produce 1,750 lumens for a total of 3,500 lumens. This two lamp explosion proof LED linear fixture is lighter in weight, has a slimmer profile, and produces more light than traditional explosion proof fluorescent fixtures. The two foot long LED tube design bulbs included with this unit are rated at 50,000 hours of service life, which is over twice as long as standard T8 bulbs. This fixture carries a T6 temperature rating and is approved for Class I Division 1, Groups C and D, Class I, Division 2, Group A, B, C and D, and Class II, Divisions 1 and 2, Groups E, F and G environments where flammable or combustible gases, vapors, dusts, fibers, and flying exist or stand the potential to exist. 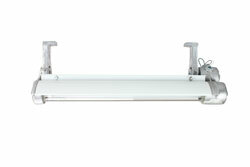 This LED linear fixture is approved for use in confined spaces. Click here to read the NEC description for explosion proof and hazardous locations. The included dimmable LED lamps have a 50,000+ hour service life, both of which result in extreme efficiency and greatly reduced maintenance costs. These fluorescent style LED lamps have internal drivers, eliminating external power components. The solid state design of the LED lamps give this fixture superior resistance to damage from vibration, extremes in temperature and a lamp service life over twice that of standard fluorescent bulbs. This second generation lamp is offered in 5600K cool white, 4500K natural white, and 3000K warm white. Our standard unit ships with 5600K unless different color temperature is specified. 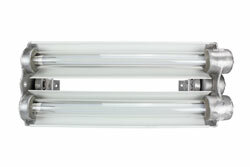 These dimmable 14 watt LED tubes work with standard 0-10 dimming controllers. Lumen output is 125 lumens per watt for a total of 1,750 lumens per bulb. While fluorescent lamps are omni-directional and illuminate 360°, the LED style replacement lamps are directional and offer a 160° beam spread. This allows for directed illumination where it is needed and not wasting light via reflectors or or over illuminating areas. This dimming LED tube uses electronic silicon control dimming. We have tested these lamps on all Lutron and Leviton electronic dimmers, such as the Leviton 6633-PLW. Please note: the dimmer switch must be installed outside the hazardous environment or use an explosion proof dimmer switch. Larson Electronics offers an explosion proof dimmer switch that can be installed within the hazardous location. The 14 watt LED lamps produce 30% more illumination than standard T8 bulbs while offering lower amp draw and increased reliability. Each lamp produces 1,750 lumens at 125 lumens per watt, for a combined 3,500 total lumen light output. An EPL-48-2L-T8 explosion proof fluorescent light, with a combined total of 64 watts, draws 0.54 amps at 120 volts AC. This LED version of the same light, with a total of 56 watts, draws only 0.47 amps at 120 volts AC at full intensity. The EPL-24-2L-LED-D-V2 operates on any voltage from 120V or 277V AC 50/60hz without any modifications. Our EPL-24-2L-LED-D-V2 LED light fixture is U.S. and Canada approved for use in paint spray booths. Please note, according to the NEC, using threaded rigid pipe does not require additional seal offs with this fixture. An EYM and seal off is necessary for flex conduit or other non-rigid pipe implementations. Suspension Mounting: Pendant mount fixtures hang from the ceiling and are suspended by rigid pipe. Each fixture features a 1/2" NPT junction box on one end, and a 1/2" NPT adjustable L-bracket on the other end of the fixture. Operators bring rigid pipe down to the threaded mounting hubs. Wiring is fed down through the rigid pipe to the junction box and tied in to the fixture`s lead wires, completing the electrical connection. 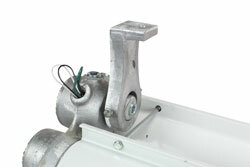 The adjustable L-shape mounting bracket provides support for the opposite end of the fixture. 6. A wrench is used to unscrew the end caps for re-lamping the fixture, while some competitive models require the "tap and knock off" method to loosen the end cap. Advancements in commercial lighting research have led to ground-breaking conclusions about the way certain characteristics of light beams affect mood and productivity in the workplace. Such findings can help businesses improve output and ensure employees are provided a conducive environment to complete demanding tasks.